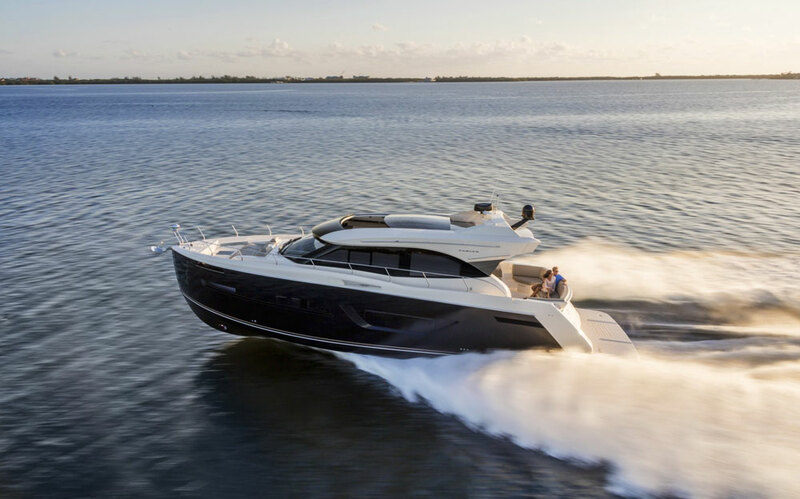 The new Carver C34 Command Bridge Motor Yacht is tall and beamy with a full plumb bow, and its broad bones could give some slim express cruisers a run for their money. The mid-30-foot production powerboat market is a highly competitive slot filled with models of all types from national and international builders. 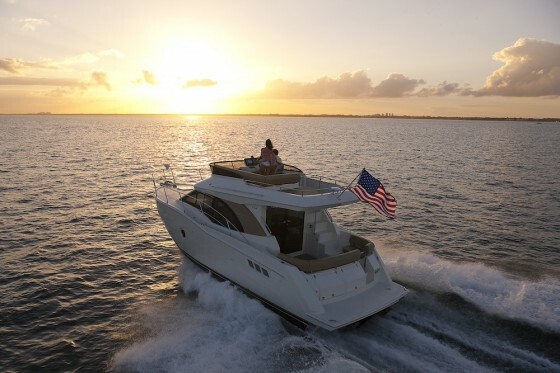 Yet many of those makes are express cruiser designs, which, while low-slung and pleasing to the eye, can’t offer the same amount of usable space within the same LOA that you’ll find in a bridge boat like the new Carver C34. Add to that the Carver’s very competitive price. 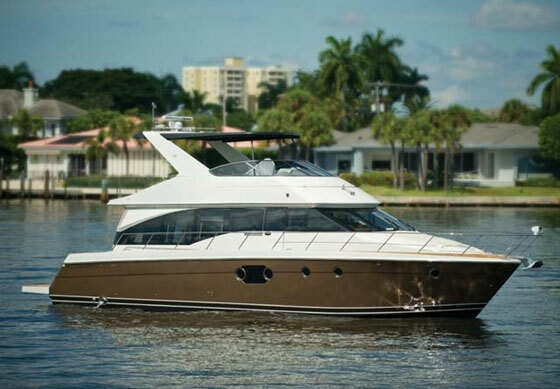 At about $325,000, the C34 represents excellent value, as it includes twin inboards, two private staterooms, a turnkey list of standard equipment, and well-appointed living areas. 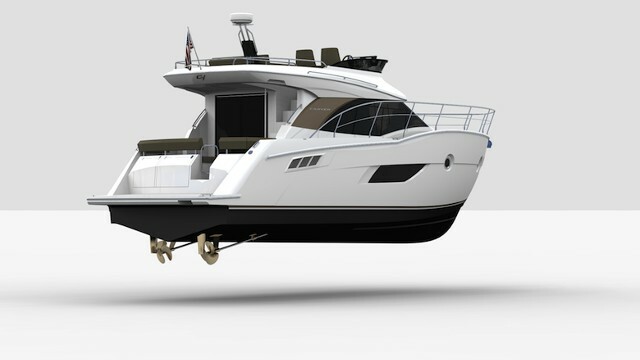 The C34 represents a new breed with new styling, for Carver Yachts. Carver also has a solid reputation. Based in Wisconsin, this is a 60-year-old builder that’s carefully carved a niche in the marketplace as a go-to source for bridge designs that maximize every inch on board to create more comfortable and more home-like entertaining areas and accommodations, which are among the roomiest in their class. 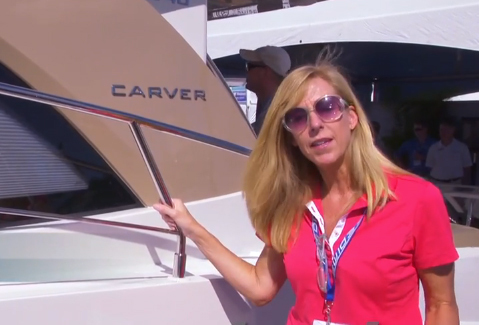 This new 34 represents the next generation in design for Carver. The company says it’s the first in what will be a new line of cruising platforms. Currently it’s the smallest model in the builder’s line, which goes all the way up to the 54 Voyager. Styling is the biggest change, and the exterior lines show the new direction that Carver is pointing its bow in. The sheerline is new for the builder, as is that plumb bow and the round ports that are both retro and modern. The lines are full and enhanced by the 34’s ample 13’ beam. Carver designed the salon with an aft galley on the C34, so the cook has easy access to the cockpit. That beam allows Carver to create a good deal of usable space in the obvious places, including the command bridge with lounge seating a big sun pad aft, and the not so obvious. Note the side-decks, which are close to 13 inches wide amidships. You’ll be hard-pressed to find another cruiser in this class that’s so easy to get around on. 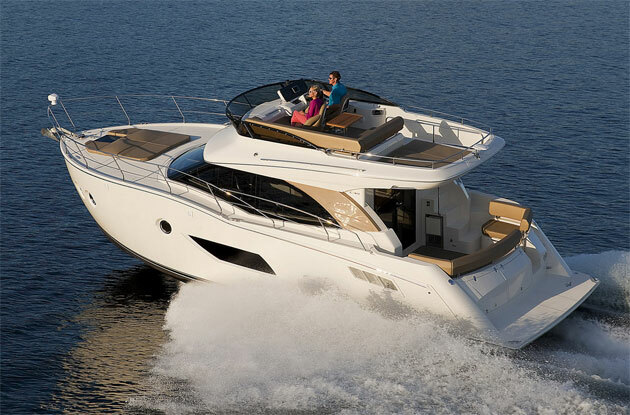 When we first saw this boat at the Miami International Boat Show, a couple was onboard and eyeing the 34 as the next family boat. They were ready to move out of their express cruiser because the crew was growing weary of opening and closing the windshield every time they had to get to the bow to secure an anchor line. Problems like this don’t exist on the Carver, since those sidedecks—which also sport tall rails—are safe to maneuver. Even tween and teen passengers who want to help out with lines can get involved. Chase new horizons, on the Carver Yachts C34. The beam makes for a great night’s sleep, too. On the Carver there are two good-sized cabins. 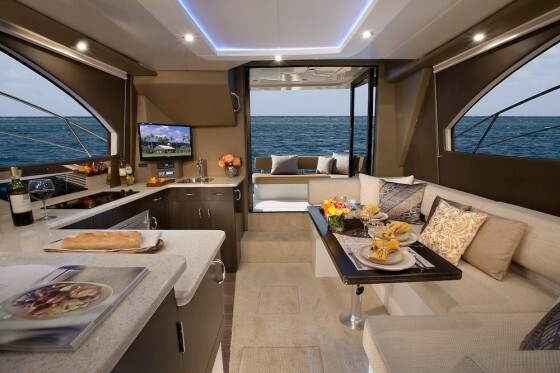 The master, forward, has an island berth, hanging lockers, 6’5”of headroom and, just as important, a bulkhead with door for real privacy. No curtains here. Likewise, the second cabin with twin berths also has a door, plus standing headroom near the entrance. A head with separate shower stall is shared by both cabins. Those are all nice features, but one of the best onboard is the salon, which is designed to be open and a savvy entertainer. The galley is up, and located aft so you can more easily serve passengers in the cockpit. That’s a design trend that’s hot on cruisers in the 40- and 50-foot class today, and it works nicely on this 34. Open the sliding salon doors to create one big party space. There are two steps that lead down into the salon, so you don’t get one seamless single-level area, but that’s a small compromise. Opposite the galley is long settee with a high/low table. (Lower it to create another berth.) Key here are the views. When seated in that settee, you can take in that long horizon line, which is the reason why many of us like to go cruising in the first place. 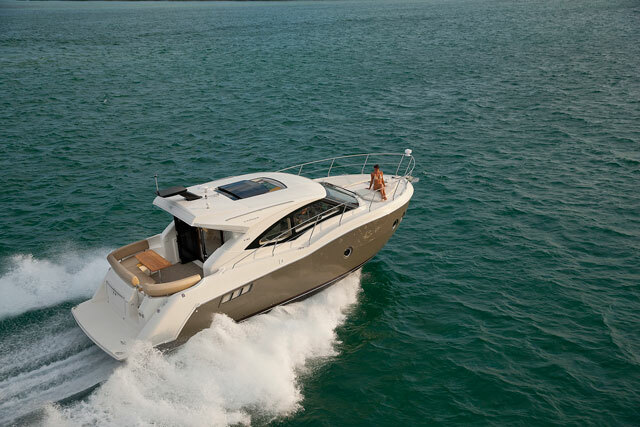 The Carver C34 is powered by two Mercury 5.7-liter gas inboards that are coupled to V-drives. That’s standard propulsion. 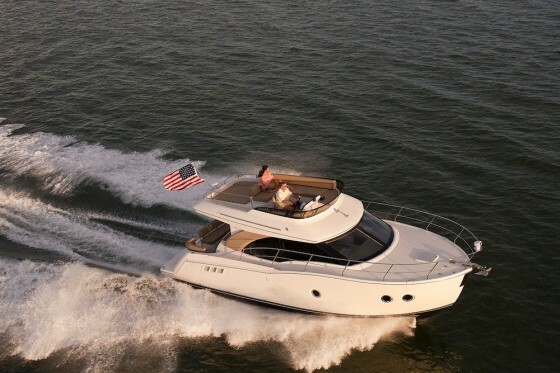 A diesel option is available, too: twin 300-hp Volvo Penta D4s. Docking with twin engines shouldn't be too challenging, but if you want more peace of mind, the C34 is offered with bow and stern thrusters. 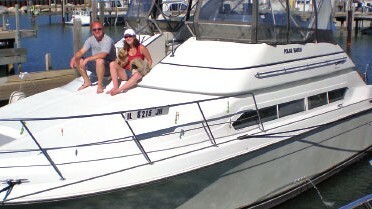 On the diesel boat, thrusters can be rigged to an optional Xenta joystick control. Teleflex SeaStar hydraulic steering is standard, as are Bennett trim tabs. The boat is operated from the helm station on the bridge, but an optional driving station in the cabin is available, too. That’s a good choice for those who want to extend the cruising season, or simply want to use their boat more often on less than perfect weather days. With so much space and comfort on the C34, why let it sit at the dock?